Allan McGregor, James Tavernier, Gareth McAuley, Connor Goldson, Andy Halliday; Ryan Jack, Scott Arfield, Steven Davis; Jamie Murphy, Kyle Lafferty, Graham Dorrans. Does anything stand out about this XI? Rangers manager Steven Gerrard really has changed a lot of things at Ibrox in the past 8 months. 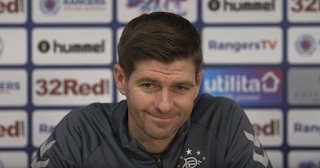 The management staff has been completely overhauled, the playing squad likewise, and a rare and precious Old Firm win has similarly seen a huge bout of optimism creeping into the ranks, following an otherwise unconvincing December. However, one of the biggest standouts about what has changed is the number of boyhood Rangers fans who are now among the playing squad, and that inherent encapsulation of the Rangers Way is certainly welcome. Of course, we want the best players, regardless of who they support, but taking a look at that theoretical XI, we count only two players in there who aren’t Rangers supporters by birth. Even on the bench we would have another one of us in Ross McCrorie, and that instilling of Rangers players who truly understand what it is to be Rangers and what it means to wear the shirt can only be a good thing moving forward. Naturally, there are mitigating factors; Lafferty sadly hasn’t quite lived up to expectations yet, while Murphy was just returning to form before that dreadful injury at Rugby Park, and we admit Graham Dorrans may be a lost cause but we hope not. Regardless though, to have at least 10 Rangers fans in the senior squad, whether they all play or not, really does help going forward. And more crucially, the fact the vast majority of these can truly play, rather than just being there symbolically as one of us, does help hugely. Against Celtic, Rangers started with five Rangers fans in the team – a completely Rangers-supporting midfield and two at the back. No one is going to tell us Scott Arfield’s Bluenose ways did not give him an extra spur against Scott Brown in the act of absolutely destroying the Celtic captain. And that on top of being able to play is a hell of a balance. Moving forward we need more than just being a Rangers fan – the old cliché fans online often cite against players they dislike who happen to be Rangers supporters is that ‘well I’m as big a fan as anyone and you wouldn’t want me to start either’, and that is true – but in the case of the majority of the Rangers squad, guys like McGregor, Davis, Jack, Arfield and McCrorie to name just five definitely enhance the makeup of the club. And it is evident that Steven Gerrard has sought to bring in Rangers fans (Arfield, McGregor, Davis) as well as enhancing the ones already here (Jack, Halliday, McCrorie) which will benefit this club long term after it felt like a few too many ‘undesirables’ had sneaked into the fabric of the institution. It will help Rangers long term. And not just because they’re ‘one of us’. Best three OF memories, in reverse order. -2nd place Arfield going for the drop ball. hitches his shorts up, bends the legs, and prepares to do whatever it takes. He is winning that ball. End of. -1st place. Game starts. 30 seconds in Biton gets the ball. Halliday empties him, jumps up, screams at him, then roars at the crowd. I deeply want to believe he screamed "you've got another 89 minutes of that coming. I am going to own you!!" I liked Arfield's broony. But those three moments sum up a point blank refusal to give in. A fan will give you an extra 1% because he knows he has to. that 1% can be the difference between winning and losing. Remember, we were a 6 inch offside and a Halliday charge down from losing. That would have been criminal. So there is still work to be done. But we are on the right road and we can believe we are going to get there.